Kathryn Kelly takes a model-like pose during the good times. 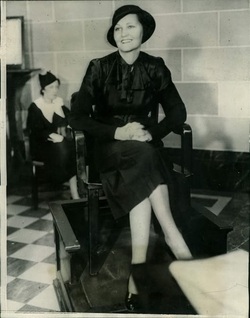 Kathryn Kelly is pictured in court testifying on her own behalf. She was confident she would be found innocent. She wasn't. 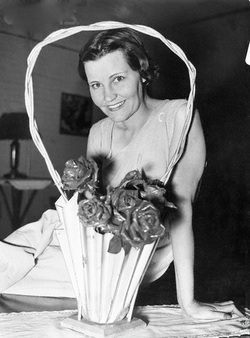 Kathryn Kelly was born Cleo Brooks in Saltillo, Miss., in 1904. By the time she was 15 she was married to a laborer, Lonnie Fry, with whom she had a daughter she named Pauline. The marriage didn't last long and Brooks, who started using the name Kathryn because she thought it sounded more glamorous, divorced Frye and was briefly married to a man named Allie Brewer. Around this time Kathryn's mother, Ora, also divorced and married Robert K. G. Shannon. Nicknamed "Boss," Shannon was a political power in the Democratic Party in Wise County, Texas. Ora and Boss Shannon owned a ranch near Paradise, Texas, which they rented out to criminals on the run for $50 a night. Ora also took up bootlegging to help the family income. Kathryn married a third time to a bootlegger named Charlie Thorne. Like her mother, Kathryn got involved in the bootleg business. Once, while Kathryn was away visiting relatives, she got word that Charlie was cheating on her. On the way back home she stopped to get gas and told the station attendant, "I'm bound for Coleman, Texas, to kill that God-damned Charlie Thorne." The next day Thorne was found shot to death. The coroner ruled it a suicide. Over the next few years Kathryn was arrested several times. Included in the charges were shoplifting in Fort Worth, and robbery in Oklahoma City. She also spent time in jail for prostitution and for receiving stolen goods. Apparently criminal behavior ran in her family. In addition to her mother's bootlegging operation, she had two uncles in Leavenworth, one for stealing automobiles, the other for counterfeiting. Her aunt was a prostitute and her cousin was a bootlegger. By the late 1920s, Kathryn was working as a manicurist in Fort Worth, but continued her underworld connections. It’s believed she met Kelly while he was still in Leavenworth and she was there visiting her uncles. Legend has it that it was Kathryn that created the Machine Gun Kelly image. She was said to have purchased the first Tommy gun that Kelly ever owned and that she made him practice with it. She then handed out spent cartridges to friends and relatives as souvenirs. A rumor started that Kelly was actually an excellent machine gunner during World War I and was so proficient with a "chopper" that he could write his name in lead and could knock walnuts off a fence post at 25 paces. Whoever made up this rumor didn't realize that George conjured up a medical deferment in college to escape being a soldier and the Thompson sub-machine gun was not used during World War I. After his release from Leavenworth, Kelly began working for bootlegger "Little Steve" Anderson in Oklahoma City, a job he likely got through Kathryn, who was Anderson's mistress. The pair soon began an affair, ran off together, taking Anderson's new Cadillac and his prized English bulldog with them. They went to Minneapolis and, in September 1930, were married.